What’s worse, a mad cult with a twisted ideology or an ex-girlfriend with an axe to grind? Fresh out of prison for possession of state secrets, maverick reporter Tom Capgras witnesses a terrorist attack on the London Tube. The release of sarin gas in a crush of commuters leaves four dead and scores more badly injured. A face in the crowd catches his attention: Gina, his first love, who years before ditched him for his best friend Charlie Marlo (deceased). Gina’s parents fear a deranged religious cult has brainwashed their daughter – and they beg Capgras to find her and bring her home. But infiltrating the sect is the easy part – getting out again proves a whole lot harder. The cult will stop at nothing to protect its secrets and dark political aims lurk behind the dogma. To gather proof, to prevent more attacks and rescue Gina, Tom must risk his life, sanity, freedom, morals – even his innocence. 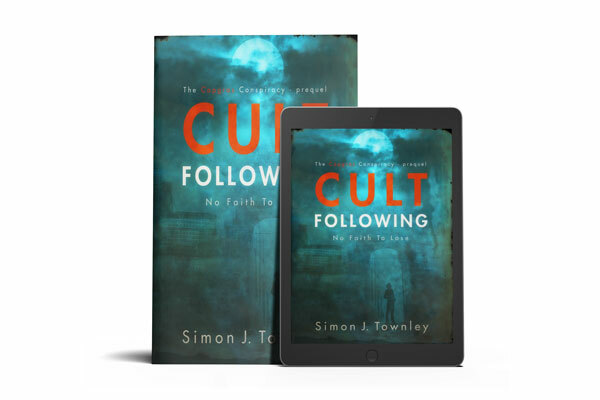 ‘Cult Following’ is a crime thriller novella set before the events of ‘Blood Read’ – the first book in the ‘Capgras Conspiracy’ series. It introduces characters from the novels but can be enjoyed as a standalone story.